VPN Gateway is used to transmit encrypted traffic between Alibaba Cloud VPCs and enterprise data centers, enterprise office networks, or Internet platforms over the Internet. You can use this service to establish reliable and secure connections for data transmission. According to China’s regulations and laws, Alibaba Cloud VPN Gateway cannot be used as an Internet access service. Supports Internet Key Exchange (IKE), IPsec, and SSL to guarantee the security and reliability of data transmission. Adopts hot-standby architecture to achieve a failover of less than a few seconds, session continuity, and zero service downtime. Provides secure internet-based connections to implement hybrid cloud computing, which is more cost-effective than leased lines. VPN Gateway is a ready-to-use service that supports dynamic configuration for quick deployment. Establishes secure connections to connect on-premise data centers and VPCs. This ensures the security and reliability of the hybrid cloud architecture. Supports the standard IPsec and IKE protocols to secure data transmission. 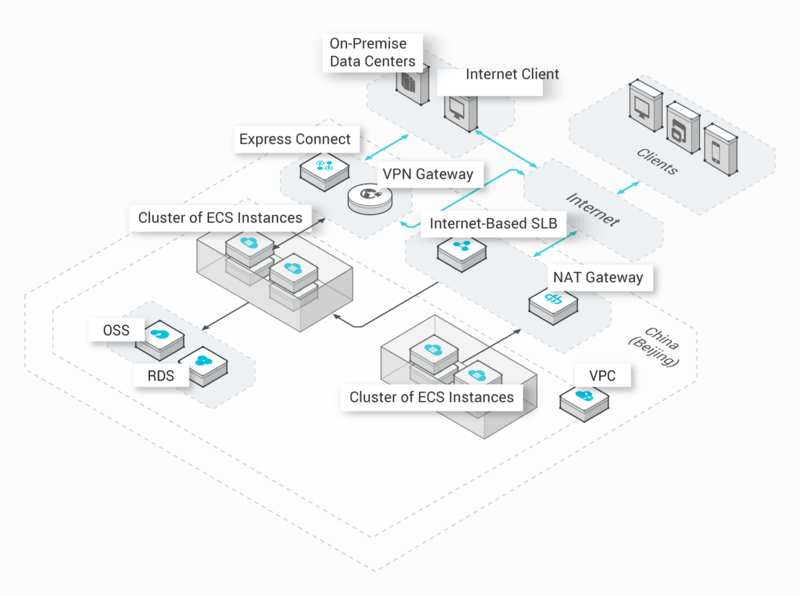 Connects enterprise data centers to VPCs. Quickly establishes secure Internet-based VPN connections to implement hybrid cloud computing. All resources in the cloud are billed based on your actual usage. VPN Gateway provides multiple resource management methods. Supports the Pay-As-You-Go billing method. VPN Gateway is a ready-to-use service that supports dynamic configuration for quick deployment. You can call the VPN Gateway service over its API or SDK, or manage the service in the visualized console. Supports SSL VPN to secure the connections established from Internet platforms to VPCs. In this scenario, the business system contains both on-premise data centers and cloud data centers. Business modules are created based on Alibaba Cloud VPCs to build a completely isolated cloud compute network. On-premise data centers and cloud data centers exchange business data over the Internet. Uses software-defined networks. This allows you to customize and manage your network. Any changes that you have made to VPN Gateway will take effect in real time. Communications between isolated VPCs are IPsec-encrypted, to secure your data on the Internet and prevent exposure. VPN gateways are used to interconnect on-premise data centers and the cloud to reduce costs.